I decided to take the plunge and bought myself a straight razor, a "sight unseen" from Whipped Dog, honed and shave ready. This will be my first. I asked Larry to pick something with good mojo. It's an old Walker square tip, which Larry rounded out for me. I like it and hope it serves me well as I learn the ropes. Reading about all your straights has been an inspiration to me! I have a leather strop and balsa board and plan to get as many shaves in as I can before I send it out to be honed (maybe 6-12 months down the road…?) or decide to upgrade. 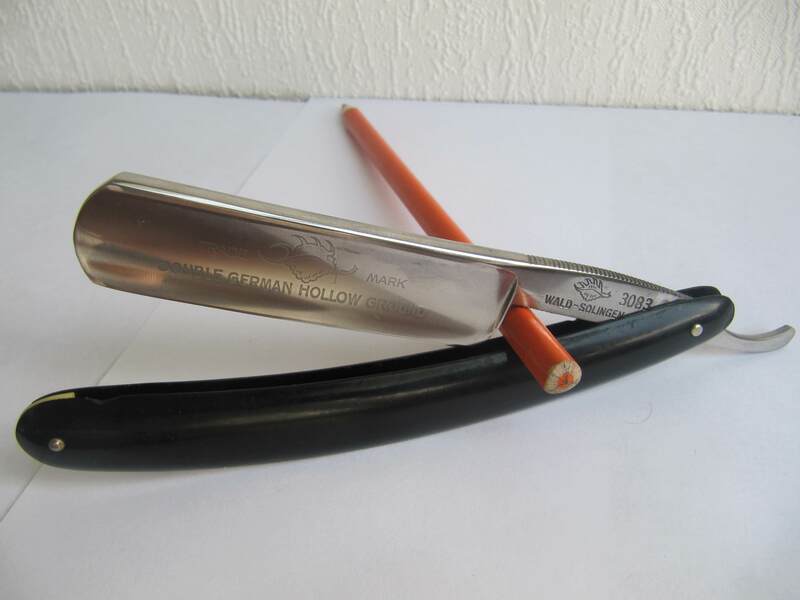 Looks like a fine razor to get you going! Just be patient and enjoy your new SRAD. Looks good, I just started with shavettes and will be using SRADs in the near future. Good luck and nice looking razor. Go slow and ask many questions. Larry is a great guy to deal with, be careful though one ST8 tends to lead to more. That looks like a great razor to learn on. 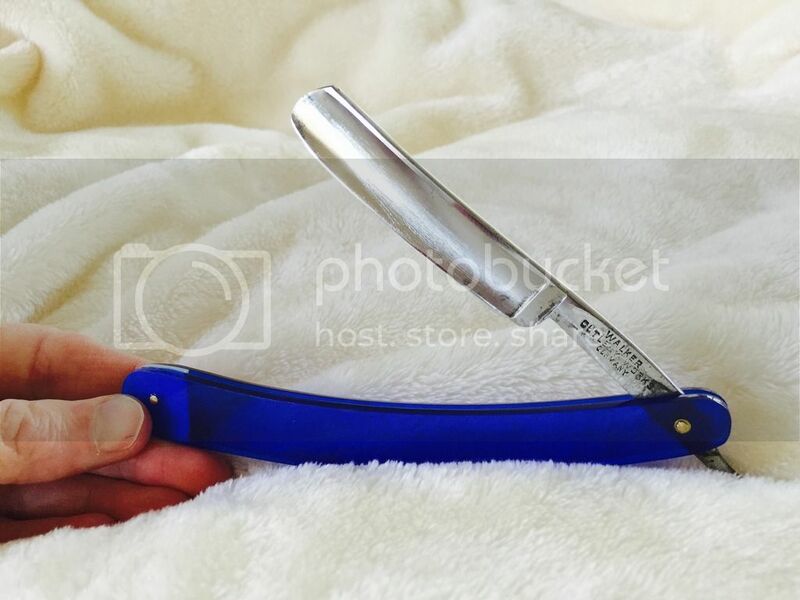 Welcome to the world of straight razor shaving. Try not to complete a full shave would be my advice start with both cheeks and see how it goes, If you feel confident enough to go a little further then do so good luck. Thank you fellas, and I appreciate your tip Jamie. That is the approach I took with my Feather Artist Club SS, and it was good advice. I'll start with the cheeks and take it slowly while I get used to the blade. First shave today and it wasn't pretty. I cut an ear lobe and although I tried to stay as vertical as I could (less than 30 degrees), it felt like the razor was dragging. Not smooth at all. Nothing close to the Feather AC SS. Prep was a warm shower, Crown pre-shave glide and Truefitt ultimate comfort. I didn't strop this razor before using, per the directions supplied by Whipped Dog. Next shave I'll strop first and see if that improves anything. (03-06-2016, 09:46 PM)Jamie Mahoney Wrote: Try not to complete a full shave would be my advice start with both cheeks and see how it goes, If you feel confident enough to go a little further then do so good luck. Jamie is right. Try sections first then eventually graduate to full face shaves! (03-08-2016, 09:27 PM)EricM Wrote: First shave today and it wasn't pretty. I cut an ear lobe and although I tried to stay as vertical as I could (less than 30 degrees), it felt like the razor was dragging. Not smooth at all. Nothing close to the Feather AC SS. Prep was a warm shower, Crown pre-shave glide and Truefitt ultimate comfort. I didn't strop this razor before using, per the directions supplied by Whipped Dog. Next shave I'll strop first and see if that improves anything. Was it tugging hard or barely? Every person's facial hair is totally different in terms of coarseness. It may be the razor was not honed well from the get go. Honing is an acquired talent that I am still working on as well to perfect. I can get my razors where they feel like they are gliding but there is always room for improvement. Then again, maybe it was your technique and you really did not realize it. Also, getting the face prepped is paramount! Are you sure you had the soap applied with the right consistency? Just things to ponder. It was tugging hard. No glide at all. I followed Lynn's (SRD) tutorial (only did the left and right cheeks, and kept a close eye on the shave angle) and have some experience with the Feather Artist Club SS, which was very smooth for me. I prepped my face just like I did with the Feather, using pre-shave gel and a slick cream after a warm shower, but had poor results using this razor. I even switched soaps for the other cheek just to be sure and got the same tugging. I'm going to strop it next go around and see what happens. I also plan to buy a Ralf Aust 5/8 round point, to compare. Did you try it before attempting to strop it yourself? It could be the honing job as well, occasionally razors get sent out by people that aren't quite up to snuff. It likely wasn't intentional but people only have so much facial hair they can test shave on. Remember when you're stropping it to keep the spine flat against the strop, a rolled edge will be really uncomfortable. If you try it again and its still tugging then you might want to have it honed again. 1st step: Play around with the angle. You're going to have to use SOME pressure, just very minor. 2nd step: Strop it with proper technique. 3rd Step: if its' still tugging bad then you might have to send it off. The angle for a straight is slightly different than the angle for a shavette, keep the spine raised about 1-2 widths off being completely flat. Did you strop before your first shave ? Larry's straights are usually very good from what I hear, if you stropped before doing your first shave and have never stropped it's possible you rolled the edge and if that's the case it will have to be rehoned, I would contact larry and see what he says on the edge but if all else fails you can send it my way and I will glady rehone for free just cover shipping round trip, about $13 but I am sure Larry will make it right. I didn't strop it before shaving, per Larry's directions. I think a stropping would help out for sure. I appreciate your offer, Panther! That is very kind of you! I made a trade yesterday with a local gent from the nook, and gave him this straight as a freebie (along with a Feather AC SS) since I ordered a different one from SRD. My journey will continue, albeit with a different blade. I appreciate all your input. There is definitely a heck of a lot more skill involved in shaving with a SR versus a DE. +1 Slow and steady does the trick.